If you don’t make your own pesto, you should be slapped. * There I said it. That’s probably the most controversial thing you’ll see on this blog, and I mean it. Why? Because you’re passing up your moment of culinary immortality. Years from now, people will forget how you looked, what you said and what you wore, but they’ll never forget the creamy, fresh taste of your pasta with pesto that summer afternoon with a side dish of fresh tomatoes tossed with fragrant basil. And there won’t be many more summer afternoons this year, so for God’s sake make some! I don’t remember the first time I tasted pesto, but it was sometime in the 80’s. My mom never made it, so it was so cool that I was able to go home and make something Italian she’d never had before. The first time she tasted it, she said, “Dis issa da besta ting I ever tasted!” My mom usually had two responses to other people’s food. #1. Dissa don’d a taste offa nading, I could a make a better danna dis. #2 Dis issa da best I ever had! So, I had to write down the recipe and she and my dad made it after that, but it wasn’t a dish she grew up with in Naples. Apparently it came from Genoa, Italy, according to this Wikipedia article. (You can see I did exhaustive research for this blog post.) And, according to the article, pesto comes from the Genoese word, pesta, (Italian: pestare) which means to pound or crush. Originally, they made pesto with a mortar and pestle (which is a lot more work than throwing it in a food processor). I could see that it might be creamier that way, but I’ve never done it. I’m sure there are purists out there who are turning up their noses saying, “She’s disgusting, I would never use a food processor.” So, someday when I have all the time in the world, (like that will ever happen) I’ll try the mortar and pestle, but for this working woman, a food processor is perfect. Most people are in one of two camps over pesto, they either love it or they don’t. Let me just say, the ones who love it are practically insane for it, so it’s definitely worth making and it’s ridiculously easy. In fact, pesto is so easy and so good, I will personally come to your home and slap you myself, if you’re buying it. And it’s versatile. You can serve it with pasta, stuff chicken breasts with it, take bread dough — spread it with pesto — roll it up and bake it, mix it with more olive oil and use it as a dipping sauce, infuse roast pork with it, spread it on sandwiches, add it to mayonnaise, or dab a little on your neck. You’ll definitely attract someone. Plus, you can make it and freeze it. When you need it, put it on the counter and it will soften up fairly quickly or microwave it, but only in five to ten second intervals because the cheese will melt and it won’t be good. 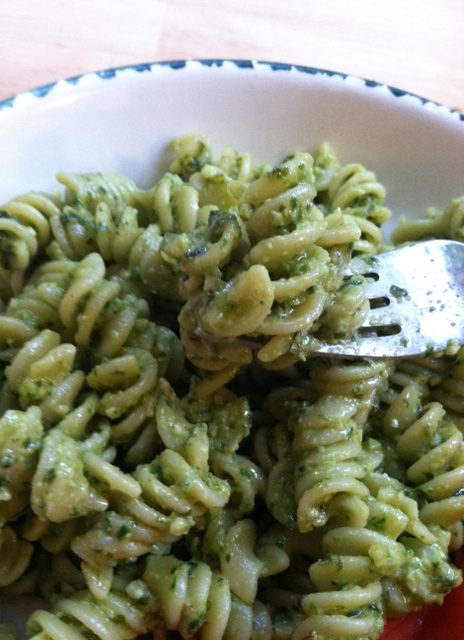 If you use rotini, then the pesto gets stuck in the twirls and is amazing! Not only are the possibilities dizzying, but you become more god/goddess-like with each serving. It’s win/win. If you use the best ingredients, it’s even better. I always use the best olive oil I can afford (extra virgin, first cold press, from Costco). I used to use pine nuts until they became too expensive and I used to use Parmegiano Reggiano, which is now out of my price range as well. (Note to self: Must find real job instead of blogging about food.) But, you know what? It’s still good with walnuts, and the good parmesan/romano mix they sell at my Italian store. In case, you’re still on the fence, here’s how easy it is. Fill a pot for pasta and put it on to boil. By the time you’re done with the pesto, your water will be boiling and you’ll be ready to put it together. Cut 1 large handful of basil leaves from plant, remove stems, (if the spines are large, remove them too) rinse and dry on paper towels. You should have a little more than a cup of slightly packed basil leaves. 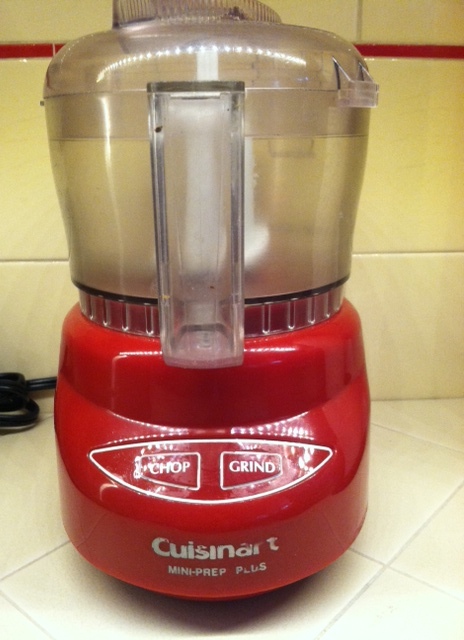 Place the basil in a small food processor with two garlic cloves and 1/3 cup of nuts. Pine nuts are great but they’re expensive right now so walnuts work just fine. Process until chopped, then add 1/3 cup good olive oil and 1/2 cup of good grated parmesan cheese/ a parmesan/romano mix works too. Process until well mixed and creamy. When the water boils, add your pasta and let it cook until it’s al dente. (A lot of people have no clue what that means. Literally, it means to the tooth in Italian.) What that means is it has some firmness. So when you bite into it it’s not mushy. How do you tell? Follow the directions and take some out as you are cooking and taste it. (One of my friends used to throw it at the wall and if it stuck, it was done. Do NOT do that. You’ll make a mess of your walls and your pasta will be mush.) Just taste it. If it’s still crunchy, let it cook more. Once the crunch is gone, it’s probably done. 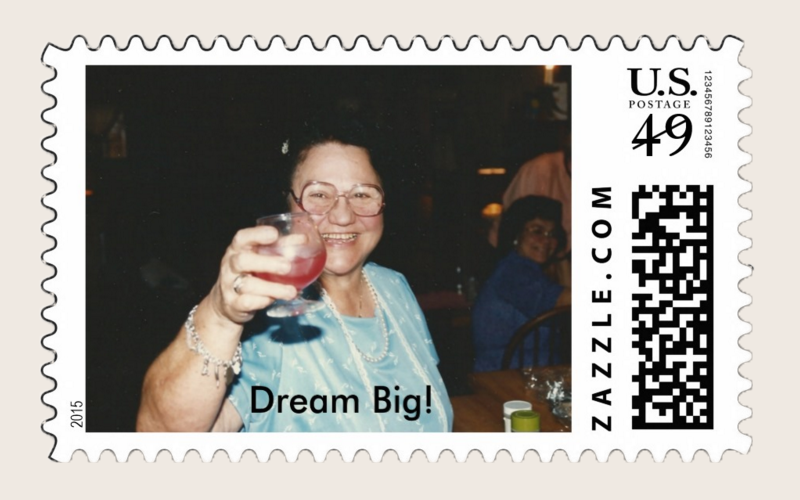 Don’t let it get mushy, or you will not be the culinary goddess, revered in someone’s memory. And don’t add oil to your pasta water, you don’t need it. Before you drain the pasta, set aside about a cup of pasta water. Drain the pasta and put it in a large bowl with the pesto, mix together until the pesto is incorporated. Add a little of the pasta water so it’s a nice creamy consistency, add salt to taste and serve. *P.S. If you don’t know me, you may not realize I’m kidding about the slapping. But I’m serious about the pesto. 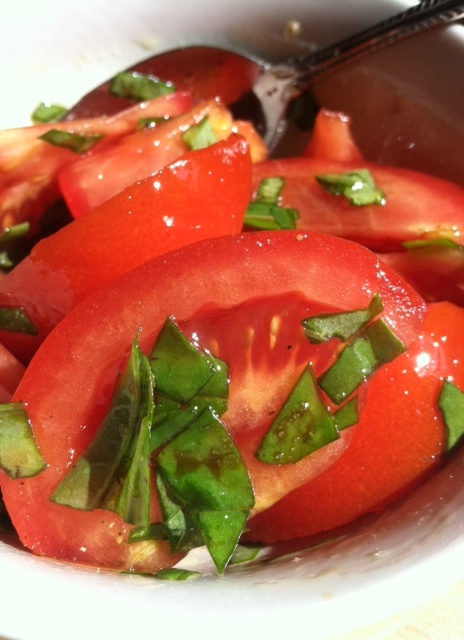 Fresh Tomatoes with basil, olive oil and balsamic – this time of year, nothing is better. Rinse and chop the tomatoes into medium sized chunks. Place them in a bowl. Rinse, dry, and roughly chop the basil leaves (remove spines from basil leaves if very large). Sprinkle basil in bowl with tomatoes. Drizzle with olive oil and vinegar, sprinkle with sea salt, and pepper, toss and serve. Don’t forget to dip your bread in when you’re done. This entry was posted in Uncategorized and tagged delicious pesto, funny, great pasta, great pesto, great recipe, humor, Italian, Italian humor, perfect pesto, Pesto, simple pesto. Bookmark the permalink. Carolyn, I’m a dork and don’t recall whether or not I replied to this comment or not, but I want to fly to Pittsburgh to give you a hug. So happy to see pesto making is alive and well. Your daughter is very smart, and certainly knows how to eat! Good for you. OK Fran, first of all, it is just unacceptable for you to make me THIS hungry in such a short amount of time! And second of all, I guess you are going to have to get in the ring with James on Sunday and give me a slap because I am currently without said food processor/sous chef and broke down and have a store bought jar in my fridge. I can’t believe that I could ever disappoint you and I am heartbroken – but maybe I get a few points since I ‘usually’ make it myself??? I love the walnut suggestion because pignoli nuts have out of my budget for a while too. Can’t wait to try it! I’ll be drooling on my pillow tonight dreaming of this dinner. OK Nicol, I’ll let you slide this time, especially since you’ll be in the ring getting slapped around enough this weekend. Maybe instead of coffee, we should have pasta with pesto. Carolyn, not only are you a genius, you raised one too. Good job. Glad I don’t have to go around slapping people. Thanks for reading and commenting! Oh thank God, that’s now two people I don’t have to slap! I am so happy to have helped! I hope you enjoy the recipe. It’s pretty forgiving. If you want, you can add more basil, garlic or walnuts. You can sort of change it to suit you. But it’s good as is. I usually wait until it’s mixed with the pasta before I add salt. That way, if a guest is trying to reduce salt consumption, they can omit it. I would love to take full credit for the recipe, but I found it on a bag of basil I bought once and it worked like a charm! Thanks for reading and taking the time to comment! Cracked up at this posting! The Pittsburgh weather this summer resulted in basil plants that spread like weeds in our garden and every nook and cranny were we stuck them (like nestled in amongst the flower beds), so I just made a dozen containers of pesto and put it in my freezer. My adult daughter took a few on Sunday and sent me pictures of her dinner last night — crostini spread with pesto and topped with a slice of mozzarella di bufala and a strip of roasted red pepper. On the side she had a salad of fresh garden cherry tomatoes that my husband grew just for her along with basil leaves marinated in balsamic vinegar and good olive oil. She called it her “Italian flag dinner”. What a good little Italian girl she is, just like you!